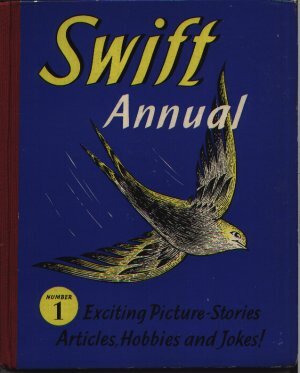 Swift Annual 1 is the first of the companion annual aimed at a slightly younger audience. It advises on its cover that it offers Exciting Picture-Stories, Articles, Hobbies and Jokes!. Its inner front and rear covers show illustrations of a variety of wild animals. As can be seen from the image, it differs from its companion annuals by using blue for its cover. Pipe Cleaner Kitten - can you still buy pipe cleaners ? Educating Archie was a ventroliquist's dummy who used to have a radio show - he's now here as a cartoon ! FRONT ENDPAPERS: A hippopotamus family, left; a racoon family, right. BACK ENDPAPERS: An armadillo family, left; a family of leopards, right.